The metaphor of the wheel of industry is nothing new. It is a staple because it is so apt and describing the motion and industrious of the business activity. Perhaps it also is used to remove the face of business as a mechanical effort not a human one. Nonetheless, the wheel is so well useful and can even be used to illustrate exactly the human element of businesses. There are three basic measures for “health” of a wheel as in those used on a car. There is a fourth measure that applies to its utility for the car. The first three measures are its inflation, tread (grip) and balance. The fourth measure is its alignment. One can also measure the fitness of our lives and our ability to function at work in the same ways. 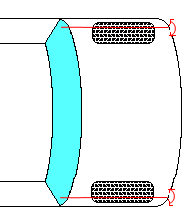 The inflation of the tire – how full it is. Is the tire completely full and ready for use? Is the pressure enough to make it durable to the task required while not so great that it is likely to blow apart? The tread of the tire – its grip or traction. This is the tire’s ability to grip into the surface it is moving along and gives it the ability to move, not just to skid across the surface. A healthy tread could be described as one that is able to maintain contact with the road, while providing enough adhesion to the road when in motion. The balance of the tire – its evenness of weight. This is the ability of the tire to spin/perform at a high rate of spin without much bounce or distortion. A well balanced tire can spin at high rates without vibration which can put stress on the frame. The first three speak to the measure of the health or condition the tire. They describe the tire as it stands alone. The fourth is a measure of the tire in relation to the car and to each of the other tires. The final is the alignment of the tire. The alignment of the tire is relative to the direction of the vehicle’s desired direction. A tire out of alignment by a few degrees can be enough to damage the tire and cause handling issues for the whole vehicle. This is how it is with individuals and organizations. The inflation is the pressure and presence the employees bring to their lives and their work. The tread, their skills and engagement. The balance is the weight (importance) we give to each area of our live: health, family, spiritual, work, et cetera). And finally, alignment is our lining up with the goals and expectations of the organization. Understanding your priorities as it relates to the overall strategic plan is key. If your alignment (the direction and effort you exert) is not parallel with the rest of the team, you are wasting time and energy and ultimately causing friction within the organization. When the team gets aligned, the team pulls together and effort is more effective. Zig Ziglar spoke often of the Belgian horse team; a single horse could pull 8,000 pounds. Two, while doubling the number of horses gives over 3 times the increased pulling power – 2400 pounds. A team, pulling together, aligning their efforts, is much more powerful than a group of individuals. Radiant Professional Services can help with organizational alignment and professional alignment. Whether it is the individual or an organization, we provide the training and the exercises that help teams get on re-treaded, their pressure checked, rebalanced and finally aligned with professional and business goals and strategic plan. Contact RPS and let us show you how we can get you and your team the traction and energy you need to reach success.